EV-Charging Roads Have Arrived. Here's Why We Do (and Don't) Need Them. EVs can now power up while they're on the move. There are lots of things that seem like threats but ultimately aren’t something you should worry about. Air travel? Safer than in a car. Sharks? You’re far more likely to die from a fireworks accident. “Range anxiety,” the fear that your EV’s battery will die and leave you stranded? Seriously — don’t sweat it. But some fears don’t go away even when you tell them to. So for people who are still worried about their EVs running out of battery, EV-charging roads may seem like the holy grail of personal transportation. Another misconception: they aren’t. Still, though, they aren’t completely useless. 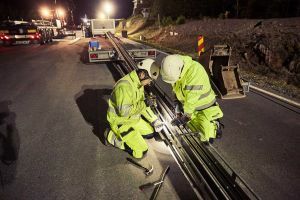 This week, Sweden unveiled eRoadArlanda, the first electrified road in the world. The 2-kilometer (1.2-mile) stretch of pavement uses a pair of electric rails to transfer energy from the road to an EV above it via a mechanical arm. Each kilometer of road cost about $1.2 million. The system keeps track of each vehicle’s use and charges the driver accordingly. For now, that’s pretty simple — just one vehicle is using the road right now: a truck owned by PostNord, a Swedish logistics firm. So, what are the chances we’ll soon have miles of EV-charging roads sprawled across the U.S.? First, they’re costly. At the cost Sweden paid, we’d need to spend $4.8 trillion to convert the U.S.’s 6.5 million kilometers (4 million miles) of road. And that’s just the upfront cost. “We seem to have a hard enough time keeping our basic asphalt and concrete roads in a state of good repair, let alone roads with embedded hardware and associated controls.” Don MacKenzie, a researcher at the Sustainable Transportation Laboratory at the University of Washington, told NBC in reference to another EV-charging road system. Second strike: The average person doesn’t need EV-charging roads. PostNord’s interest in electrified roads makes sense — the company uses big, heavy trucks to transport goods. The bigger the vehicle, the more power needed to move it, which can be a strain on batteries. Likewise, electric roads make sense to power vehicles that move a lot throughout the day, so we could use them along public bus routes or places taxies frequent. Outside of those situations, though, they aren’t terribly necessary. A fully-charged battery in an existing, affordable EV is enough to get 87 percent of American drivers where they need to go throughout the day. As at-home chargers become more common, that figure could reach 97 percent, according to Erik Fairbairn, founder of POD Point. Did you catch that? The chance that you’ll need to charge your EV’s battery will be an “extreme case.” Even if you were one of those extreme cases, you get a low-battery warning telling you to head to a charging station (which are becoming more and more ubiquitous). To sum it up: Don’t let the worry that you’re going to get stranded stop you from buying an EV.